Get into the spirit with official Oklahoma City Thunder home and office merchandise for any gameday occasion. 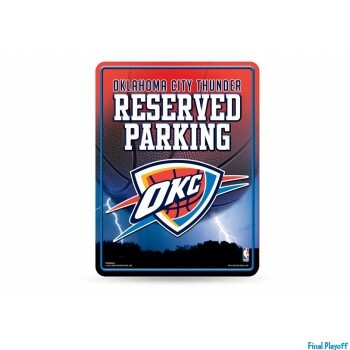 Take a look at your Oklahoma City Thunder parking signs which are sure to decorate any wall or door. Another great way to let your neighbors know who you root for during game season is with an Oklahoma City Thunder banner or garden flag. Inviting friends over to a bbq for the game? why not have the chef deck out with an Oklahoma City Thunder bbq set apron to match the walls with official team posters.